Colombia's Carlos Sanchez became the first player to be sent off at the 2018 World Cup as Japan secured an entertaining 2-1 win in Saransk. The former Aston Villa midfielder was dismissed after just four minutes in the Group H opener for deliberate handball and Shinji Kagawa made no mistake with the resulting penalty. 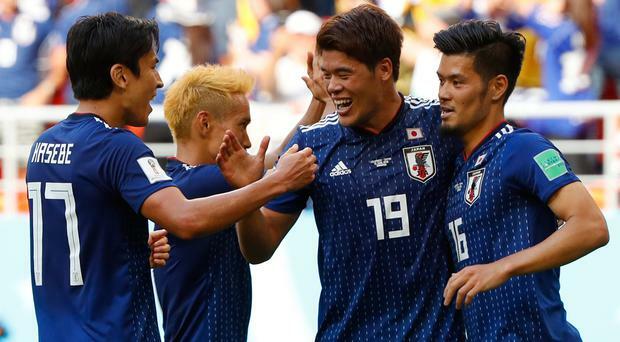 Colombia equalised shortly before half-time through Juan Quintero's free-kick, but Japan dominated the second half and were good value for Yuya Osako's late winner. James Rodriguez - who finished the 2014 tournament as top scorer - was left out of Colombia's starting XI due to a muscle injury and the South American side quickly found themselves facing an uphill task. The first red card of the tournament was produced in the opening exchanges, with Sanchez given his marching orders for denying a clear goalscoring opportunity. Osako broke clear and, although his initial effort was parried by David Ospina, Kagawa's follow-up effort was goalbound until Sanchez stuck out an arm. Referee Damir Skomina had no hesitation in pointing to the spot and immediately dismissed Sanchez, with Kagawa's Panenka penalty giving Japan the lead after six minutes. Takashi Inui missed a good chance to double Japan's advantage after 18 minutes when he curled an effort narrowly past the far post after good build-up work by Kagawa. Despite enjoying the lion's share of the possession - and much of it in Japan's half - Colombia struggled to carve out chances until Radamel Falcao volleyed straight at goalkeeper Eiji Kawashima after 34 minutes. Kawashima's error then gifted Colombia an equaliser, with Quintero's low free-kick creeping over the line at the near post after Falcao was brought down on the edge of the area. Japan began the second half strongly and eight minutes after the break Kagawa played in Osako, whose shot on the turn was beaten away by Ospina. Arsenal keeper Ospina again had to be alert to turn away Inui's 57th-minute effort and moments later Colombia boss Jose Pekerman introduced talisman Rodriguez. Hiroki Sakai should have restored Japan's lead when his low cross from the right was played back to him by Osako, only for the full-back to drill the ball at Oscar Murillo, with the deflection taking the effort wide. However, from the resulting corner Keisuke Honda's delivery was headed in by Osako. Rodriguez wasted Colombia's beat chance of an equaliser 10 minutes from time when his shot from 12 yards was deflected over the bar.